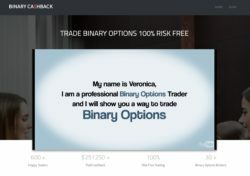 Binary Cashback is a cashback program that is supposed to pay you for depositing with a binary options broker. The theory is this: If you deposit money with an affiliated broker, people who run the cashback program will get paid for referring you. In return they will give you back a part of their commission, so your deposit should become entirely or partly free. The first problem with Binary Cashback and other similar programs is that you have no guarantee to get your cashback. So you might deposit money with the broker and receive nothing in return. If that happens, you might lose all your money, because Binary Cashback programs are most often associated with brokers that are not regulated. And such brokers are known for refusing withdrawals. For example Binary Cashback redirected us to a broker called Crown Finance. This broker provides a British address, but it is not regulated. So if they decide to ignore your withdrawal request, you are pretty much done, nobody will help you. It is even worse with the cashback program, because you have no legal right to get money from them, so if they refuse, you cannot do anything with it. All in all cashback programs are associated with a great risk of losing your money. You could send your money to the broker and never see it again. Nowadays a cashback program is pretty useless anyway. Why would you need it? Do you have a strategy that is profitable and verified? Then go and trade it with a solid and regulated broker and make money. You don’t have a strategy and you would just like to try binary options trading? Then go and get a free demo account where you can try everything risk free, no deposit required. As you can see, cashback programs are not really worth the risk of losing your deposit, you don’t need them.